THE TRIBUNAL RESUMED AS FOLLOWS ON THURSDAY, 12TH OCTOBER 2000 AT 10:30AM. CHAIRMAN: This morning’s hearing, ladies and gentlemen, will be confined to a brief statement from me in regard to a contingency that has arisen within the last day or so. Mr. McGonigal, senior counsel, has informed the Tribunal that in the light of Mr. Haughey’s medical condition, he will not be able to give evidence this week. A further medical report and further assistance in that light has been provided to the Tribunal concerning Mr. Haughey’s medical condition and I am now examining the position with a view to considering whether it would be appropriate to make some alterations in the regime whereby Mr. Haughey gives evidence for in or about two hours at a time on between three to four days a week. Whilst it is regrettable that the Tribunal’s proceedings may be delayed for a few days, it is equally important that every witness testifying before the Tribunal should have ever opportunity to give a good account of himself or herself and within reason, the Tribunal will endeavour to accommodate itself to a witness’s long term or short term health requirements. The Tribunal lawyers will be discussing the matter with Mr. Haughey’s lawyers over the next day or so. I do not expect that this will pose a major difficulty and the Tribunal will, within the next week, indicate how it intends to proceed. 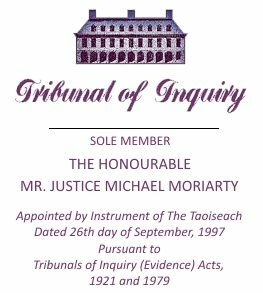 Whilst on most occasions to date, when taking the evidence of Mr. Haughey, the Tribunal has not taken other evidence in public, I intend to include, in resumed sittings, the evidence of other witnesses.